Got home this evening after a small road trip thru central Queensland & return via the coast. 2 weeks away & 3,648kms covered. Results are, A, I live in a very very big country, & B, my car is utterly filthy. 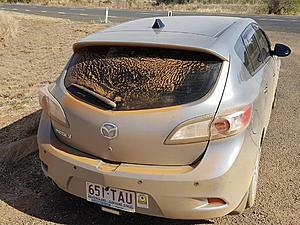 Do a road trip that long around here in the summer time and there *might* be a bit of dust on the back, however, the nose will be completely unrecognizable due to a thick layer of dead bugs.